Partly because it’s on MTV but mostly because it’s just a cool show, teen dramedy Awkwardalways showcases really great music.Last night’s episode, for instance, featured songs fromSaskwatch (“Your Love”), Madi Diaz (“Heavy Heart”), and Wild Nothing (“Nocturne”), among many others. 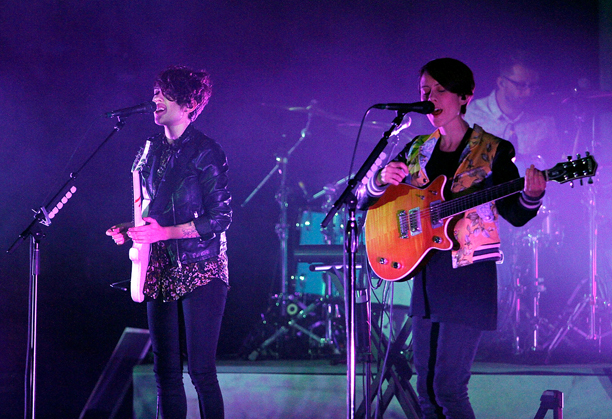 And now, you can expect the show’s music to get even better; EW has exclusively learned that songs on the May 7 episode of Awkward will be curated by twin-sister pop star duo Tegan and Sara. That last one there is kind of a gimme — of course the girls had to include a song of their own. But that’s no complaint — “I Was a Fool” is a dang good song and one of the highlights from their latest album. Naturally, the folks at Awkward and MTV have given — and will continue to give — some love back to Tegan and Sara for their help: This season already featured “Goodbye, Goodbye,” in the second episode, and “Drove Me Wild,” and “Closer” fromHeartthrob.